ENSENADA, Baja California, Mexico—Coverage continues on the El Rey Network Sunday of the four-race 2018 SCORE World Desert Championship with a one-hour show spotlighting the Lucerna Hotels & Resorts Tijuana 22nd SCORE Desert Challenge. The newest show will premiere on Sunday (Dec. 9) at 6:30 p.m. Pacific Time. It is also scheduled to re-air again on Sunday at 10 p.m. Pacific Time. Hosts of the ERN shows from the SCORE World Desert Championship this year are SCORE champion racers Cameron Steele and Alan Ampudia. Producing these shows for SCORE is award-winning BCII TV of Los Angeles. With 161 official starters, there were racers from 22 U.S. States and six countries. Nations were USA, host country Mexico, Canada, Italy, New Zealand and Peru. States with racers were Alaska, Arizona, Arkansas, California, Colorado, Connecticut, Florida, Idaho, Kansas, Louisiana, Missouri, Nevada, New Jersey, New Mexico, New York, Oklahoma, Oregon, South Dakota, Texas, Utah, Virginia and Wyoming. Veteran SoCal desert racer and popular action sports television announcer Cameron Steele climbed to the top of the marquee SCORE Trophy Truck class by winning the special format, Lucerna Hotels & Resorts Tijuana 22nd SCORE Desert Challenge. The unique, two-day event was Round 3 of the four-race 2018 SCORE World Desert Championship and was held at Rancho Casian on the southeast outskirts of Tijuana. After leading the first two of four laps on the first day in the elapsed-time race, Steele, 50, of San Clemente, Calif., captured his first career SCORE Trophy race win in a time of three hours, 21 minutes, 36 seconds while averaging 40.12 miles per hour over 134.8 race miles in his Geiser-built No. 16 Monster Energy Desert Assassins Ford Raptor. Steele posted consistently solid lap times on the first day of 49 minutes, 37 seconds and 50:15. His first lap time on the first day was the fastest lap time for any vehicle in the race. On the second day he covered the rutted out and more challenging course with lap times of 51:24 and 50:19. The event featured two days of racing scored as one race. The race route was a 33.7-mile loop course through the challenging hills in the area that each class ran two laps each day for four total laps and 134.8 total race miles. The classes were split into three groups, running one session each day to determine the final results. There were 161 official starters racing in classes for Pro and Sportsman cars, trucks, UTVs, motorcycles and quads. There were 96 official finishers in the race for a finishing rate of 59.6 percent. The impressive total of 161 starters was the eighth-most in the 22 times this race has been held. SCORE Trophy Truck is celebrating its 25th year as the featured SCORE racing division for high-tech, 950 horsepower unlimited custom trucks. Justin Morgan of El Cajon, Calif. put in consistent lap times for two days to take his third straight SCORE Baja motorcycle victory as well as his own Pro Moto Unlimited class with an overall time for the four 33.7-mile laps 3:34:13 with an average speed of 37.76 mph. Morgan, who teams with Mark Samuels, Yucca Valley, Calif. and the pair has won both prior SCORE Baja races this year, rode solo both days at the Tijuana race. Morgan ran lap times of 50:11 and 50:24 on day one on his No. 7x Honda CRF450X. With the course deterioration and fog during his group’s run, he turned in slower but fast enough lap times on day two of 57:21 and 55:39. Leading the Pro UTV FI (Forced Induction) class which had a race-high 19 starters and the overall UTV winner was international drifting champion Rhys Millen. Millen, originally from New Zealand lives is San Juan Capistrano, Calif., had a winning time of 3:48:52 in his No. 2966 Polaris RZR XPT1000 Turbo. Topping the field in the Pro UTV NA (Naturally Aspirated) class was 19-year old rookie SCORE racer Kaden Wells, St. George, Utah, Polaris RZR XP1000 in 3:49:23, just 31 seconds behind Millen in the race for the overall UTV title. SCORE races in 2018 are airing on the El Rey Network domestically and around the globe on ESPN International and syndication. 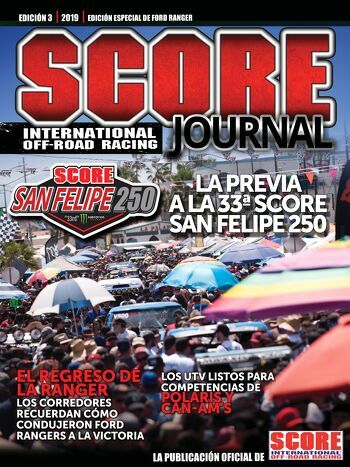 The season-ending SCORE Baja 1000 will air as a two-hour special for race coverage.